Bobs Burgers has got to be the best new show. Its been 10 years of nothing but Seth McFarland shows and not that that's a bad thing, but Bobs Burgers comes out of left field and frankly its a breath of fresh air. Its about a small business owner named Bob, who lives in a apartment flat above his burger restaurant..
His wife and three kids help run the business. Which is nice setting for an animated show as the majority....if not ALL, (except Futurama) have had a setting in suburb in a house... Which is the tried and true formula we all know and love, again everything about this show is a breath of fresh air. For the show to be in the first season, the voice cast has some incredible chemistry. Look back at season one of The Simpson, Family Guy, Futurama, always with a new voice cast the chemistry takes a few episodes to really click,but Bobs Burgers has managed to pull this off right out of the gate. Its hard to classify what type of humor the show brings to table, but if I had to I would say the humor is dry. You will find yourself laughing at things one or two scenes after the punch line. The kids are hilarious, and as the show is still in season 1, we have probably yet to see all the supporting characters, but from what I have seen so far, I am very optimistic. I am so hopeful for this show its keeping me awake at night. 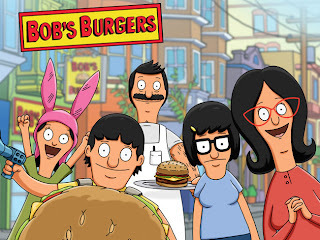 http://www.fox.com/bobsburgers/ -------This is Fox's home page for the show, you can watch high quality episodes here. i haven't seen an episode yet, i'll make sure i send FOX an email.